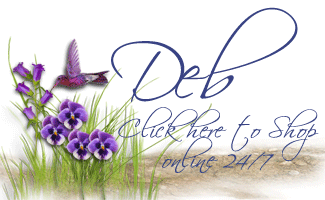 Creation Station Blog Tour – New Product Sneak Peek! Welcome to our blog tour – this time we’re going to give you a sneak peek at some projects that we’ve made with new products from the upcoming Annual Catalogue! Another reason to be excited – we have 3 new members in the Creation Station team! Please join me in welcoming the incredibly talented Sarah Klass, fabulous Dena Renkow and creative whiz Martha Inchley (a fellow Canadian – yay!) I know you’ll love their contributions to our blog tours, and the inspiration they’ll provide. Sarah and Martha are joining us this tour, and Dena will be joining us on the next one. We make it easy for you to enjoy the blog tour; we’ve linked our blogs in a circle, so that no matter where you start, you can simply keep clicking the ‘next’ button to move onto the next blog (unless of course you prefer to go backwards; then click the ‘back’ button!). I know that you’re all dying to see some of the new products, so let’s dive right in! Isnt’ that flower image gorgeous?! It reminds me of an Amaryllis – but I’m not sure… I’ll have to do some more research. For now, I was too excited to get stamping! 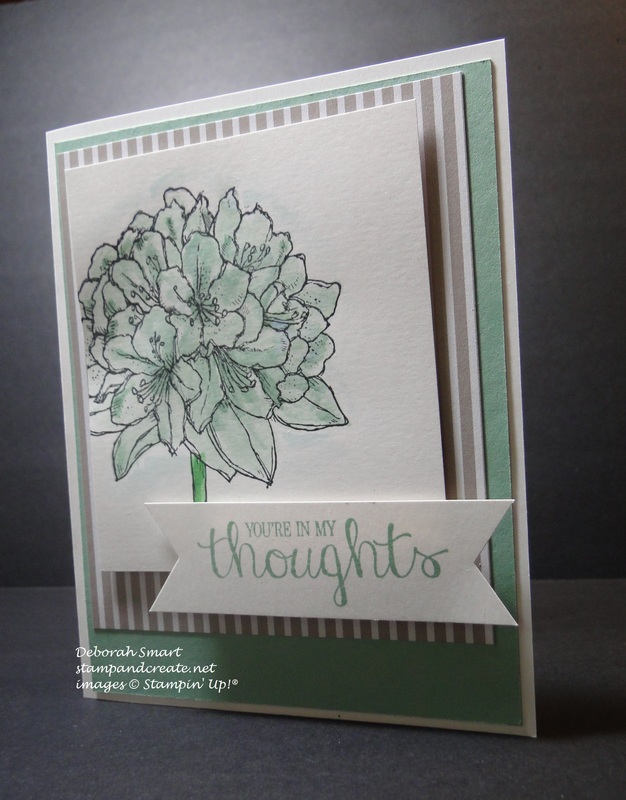 I used a card base of Whisper White cardstock, and layered a panel of Watermelon Wonder cardstock on top. 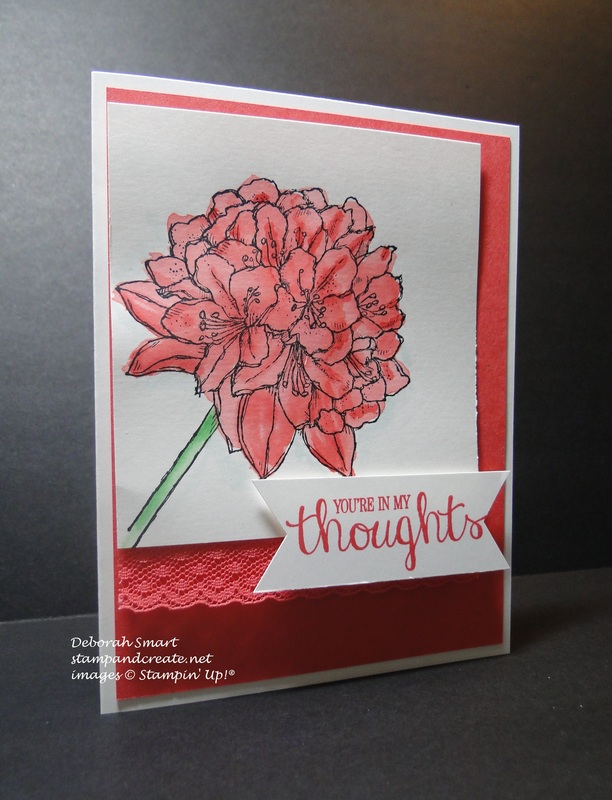 I stamped the flower image in Black Staz-On ink, then used an Aqua Painter and Watermelon Wonder ink to colour the flower. It is so easy feel ‘artsy’ doing this! When it had dried a bit, I went back and added more ink, to add dark shading. The stem is coloured with the Aqua Painter and the new Cucumber Crush ink – it’s a bright green, and I can see me using it a lot at Christmas. The sentiment was stamped on Whisper White in Watermelon Wonder, and I used the new Banner Triple Punch for perfect tails! Before attaching it all to the card base, I added a strip of the gorgeous new 1″ Dotted Lace Trim, in Watermelon Wonder, along the bottom of the stamped panel. I used the same colouring technique; and Aqua Painter and Mint Macaron ink over the image stamped in Black Staz-On ink, and the stem coloured with Cucumber Crush. I also did the banner sentiment in the same way, with the new Banner Triple Punch. On this card, I did add a panel behind the stamped image; this is from the delightful Cherry On Top Designer Series Paper Stack – these are wonderful stacks, in a new size of 6″ x 6″ – perfect for card making & scrapbooking! This particular pattern is a lovely striped of Tip Top Taupe and Whisper White. This is an amazing photopolymer stamp set – it comes with 22 stamps; 14 images and 8 sentiments. Another bonus – it has a coordinating PUNCH!! Woot!! It’s called the Tree Builder punch, and punches out 7 different shapes. For this card, I created a triple scoop ice cream cone; the cone was hand cut, but the scoops were each punched, as well as the cherry on top. 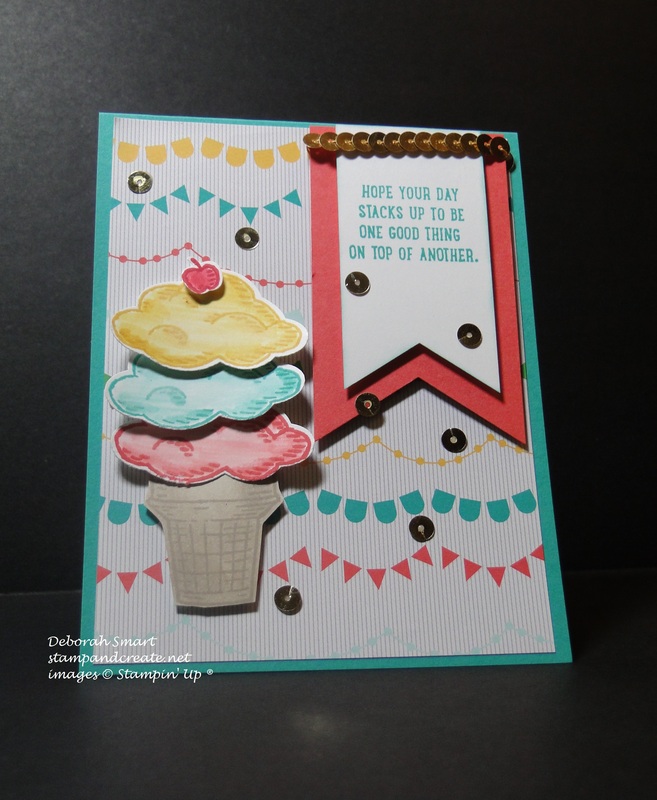 I used all of the new In Colours on this card; the ice cream was stamped in Watermelon Wonder, Mint Macaron, and Delightful Dijon inks, then coloured using the matching Stampin’ Write Markers. The cherry was coloured in Real Red. The ice cream cone was stamped onto Whisper White cardstock using Tip Top Taupe, and coloured using the same ink, with a Sponge Dauber. 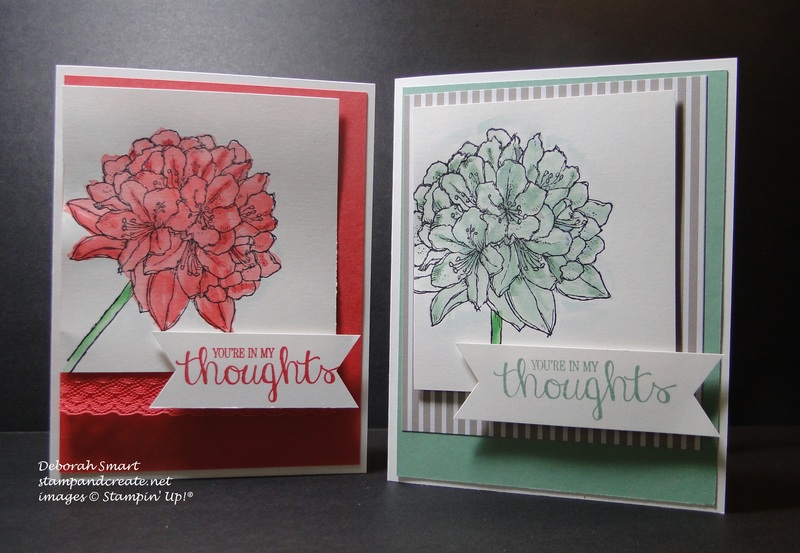 The sentiment was stamped in Bermuda Bay ink, to pull in the colour from the Designer Series Paper – another pattern from the Cherry on Top DSP Stack. I layered the sentiment on top of a piece of Watermelon Wonder cardstock, after punching banner tails using the Banner Triple Punch. The Banner Triple punch is called that because you can punch 3 different sizes of banner ends – 1″, 1 1/2″ and 2″, on whatever length of cardstock you want. It is going to be VERY heavily used by me and my classes, I know that for sure! Would you have guessed that this is the same stamp set?! Along with the ice cream cone, it also comes with this other shape, which you can use for a basket of flowers, as I did here, or you can make it a cupcake! Here I created a little window scene, with baskets of flowers outside the window. I stamped the baskets on Whisper White cardstock using Crumb Cake ink, and coloured them using the Crumb Cake ink and a Blender Pen. The flowers were all coloured using Stampin’ Write markers, in colours of Watermelon Wonder, Mint Macaron, Blushing Bride, Pear Pizzazz and Daffodil Yellow. 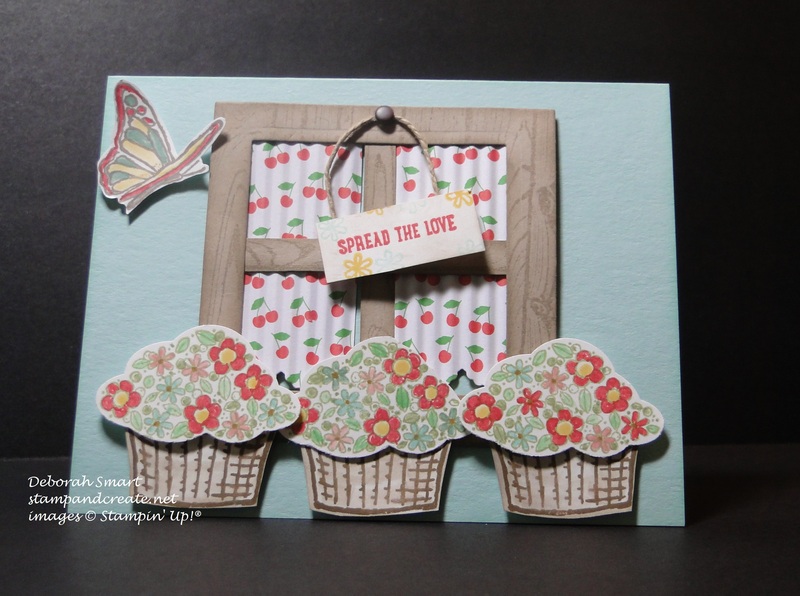 I created the window frame by stamping Crumb Cake cardstock with the Hardwood background stamp, in Crumb Cake ink. The curtains were made using another pattern of the Cherry on Top Designer Series Paper stack; I cut the pieces, scalloped the bottom using a retired Adorning Edgelit die, then ran the pieces through the retired paper Crimper. I decided to make the sentiment like a little outdoor sign hanging from the window; stamped in Watermelon Wonder ink on Whisper White cardstock. I used the individual flower stamp from this set to stamp some random flowers in Delightful Dijon and Mint Macaron, then I distressed the sign a bit using a Sponge Dauber and Crumb Cake ink. The butterfly is from the Best Thoughts set, and I used the Daffodil Delight, Mint Macaron and Watermelon Wonder markers to colour it. Everything was layered using Stampin’ Dimensionals onto a card base of Pool Party cardstock. You see what I mean about the many, many ways to use this stamp set?! Here you can see that the ice cream scoops are now clouds! My card base is of Pool Party cardstock; for the next layer I used the retiring black Chalkboard paper – I just love the depth of this black, and it’s so wonderful to stamp on; it’s too bad that it hasn’t been carried over to the new catalogue. I don’t know if you can see in this picture, but I stamped some raindrops – yes, there is a stamp for raindrops! – in Versamark ink onto the black Chalk Paper. I stamped the clouds in Versamark ink onto Smoky Slate cardstock, then heat embossed them with Silver embossing powder. Because every cloud has a silver lining! (see what I did there?) I stamped & embossed the sentiment in the same way. 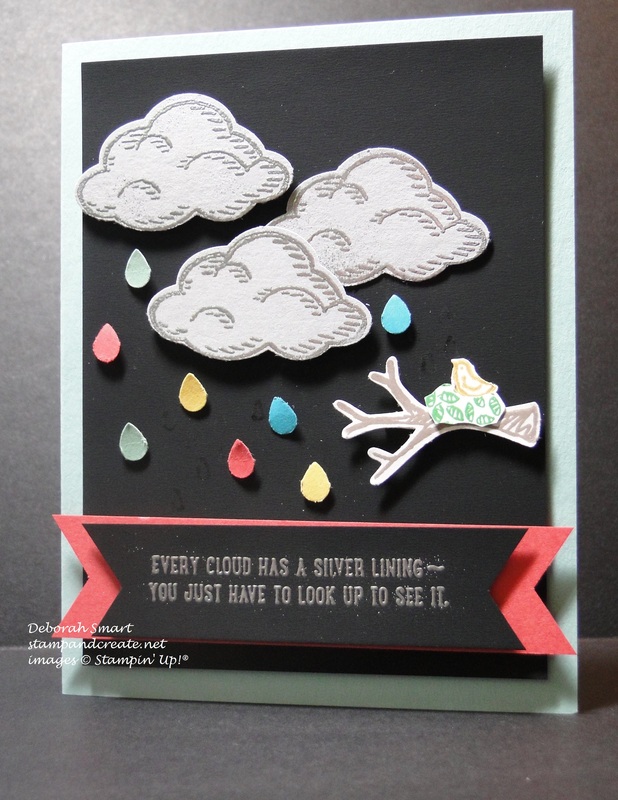 I punched out some bright raindrops using the Tree Builder punch and bits of cardstock in Bermuda Bay, Mint Macaron, Daffodil Delight and Watermelon Wonder, and attached them using Glue Dots. I wanted to do more projects, using the new Bag Builder Punch and the Cotton Paper – but I had to stop somewhere! I’m sure that the other members of the team will have used those for you to see. Thanks for spending some time with me; I hope you’ve enjoyed my projects, and that they have you looking forward to receiving your new catalogue. I’d love to hear your feedback, if you’d like to leave your comment! If you started at the very beginning of the tour, you have now reached the end. If you started somewhere else, then all you need to do to continue is to click the Next button, and you’ll be taken to our fearless leader’s blog – the talented Jen Arkfeld! I know you’ll love her projects. If you’d like to head back and have another look at Sara Levin’s amazing creations, just click on the ‘Back’ button. Next Next post: You’re Invited to My Party! Thank you for sharing, love your designs. That flower in Best Thoughts is one of my favorite pre order items. It looks great watercolored!